Back in June of 2008, I wrote a piece on Victorian Funerals and Mourning. In it I left the funeral cortege pretty much at the gates of the cemetery; an omission that I want to correct in this blog. With a rapidly growing population which more than doubled in the first half of the nineteenth century, arrangements for the interment of the dead were totally inadequate. At least until the 1830s, most burials took place in parish churchyards where the standards of sanitation were often so low that the churchyards were a health hazard to church-goers and to those who had business in the burial fields. Black's Guide to London and its Environs (1870), recalled the situation. The barbarous practice of interring human bodies within the precincts of the Metropolis has now been wholly abandoned. But it is only of late years that it has been put down and not before several of the churchyards had become full to overflowing and the neighbourhood had been rendered notoriously unhealthy, "the plague spots of the population." Vaults and catacombs underneath churches have been in most instances closed against the future deposit of coffins therein. The coffins previously there, if not removed by the relatives of the deceased, have been collected in one common vault which has been closed and built up, never afterwards to be opened on any pretence whatever. By the 1830s, it was clear something had to be done, but what? A proposal had been floated, in the 1820s, by the barrister, George Frederick Carden, to create a commercial cemetery on the outskirts of the great metropolis. His inspiration was the cemetery of Père-Lachaise, in Paris, which he had visited in 1821. He could not help but be impressed by the garden atmosphere which surrounded the graves when compared with the squalor of the graveyards in London. Enlisting influential figures in his campaign, a joint stock company was formed and in mid-1831 a tract of 55 acres was purchased at Kensal Green. Here, the first of the great cemeteries of London, the first of "the magnificent seven" as they came to be called in the 1980s, was laid out. Landscaped and with mausoleums and catacombs, buildings designed in the classical style, it became the final resting place of choice for many of the most prominent men and women of the age. The first burials took place there in early 1833, and within ten years six more large cemeteries had opened near London: West Norwood Cemetery (1837), Highgate Cemetery (1839), Abney Park Cemetery (1840), Nunhead Cemetery (1840), Brompton Cemetery (1840) and Tower Hamlets Cemetery (1841). All of the "magnificent seven" cemeteries were privately owned and were established under act of Parliament. Over the years, their popularity rose and fell both as burial sites and as places of interest. In 1858, for example, Nelsons' Guide to the Environs of London noted that "only Highgate, Kensal Green, and Norwood, are worth visiting." Kensal Green Cemetery, the oldest of the seven, is still run by the original company which established it. Approximately a quarter of a million individuals are buried there and under the original mandate the existing bodies may not be exhumed and cremated. Neither can the land be sold for development and once it is full and can no longer function as a burial ground, it is to remain a memorial park in perpetuity. Numerous well-known Victorians are buried in Kensal Green including authors William Makepeace Thackery, Anthony Trollope, Wilkie Collins and Thomas Hood, Actors Fanny Kemble and William Macready and others as diverse as the acrobat and tightrope-walker Charles Blondin, the engineer Isambard Kingdom Brunel and the mathematician Charles Babbage. G. K. Chesterton, in The Flying Inn, wrote "...that there is good news yet to hear and fine things to be seen, Before we go to Paradise by way of Kensal Green." West Norwood Cemetery, in the London Borough of Lambeth, is also known as the South Metropolitan Cemetery. Well known for its Gothic Revival architecture, it is on the National Register of Historic Parks and Gardens and is considered one of the significant cemeteries in Europe. Including cremations and those buried in the catacombs, West Norwood is the final resting place for more than 200,000 souls. In the mid-1960s, the local council purchased the cemetery, removing thousands of monuments and restarting burials. As part of what has been described by the Friends of the West Norwood Cemetery as "desecration," existing plots were even sold for re-use. It was not until 1995 and 1997 that the council's practices were declared illegal. Sadly, by then most of the damage had been done and while the council was required to restore some of the monuments, for most it was too late. Numerous Victorians are to be found in the cemetery. The founder of the Tate Gallery, Sir Henry Tate lies in West Norwood as does the founder of the Reuters news agency and the co-founder of the P. and O. shipping line. Here too can be found the remains of Maria Zambaco, artist, model and one of the beauties of the age who modelled for Edward Burne-Jones and appears in his "The Beguiling of Merlin." Another notable woman lies in this cemetery, Isabella Beeton, famous for her Book of Household Management,who died at the age of twenty-eight. Another one of the "magnificent seven" is Highgate Cemetery, probably best know as the final resting place of Karl Marx. 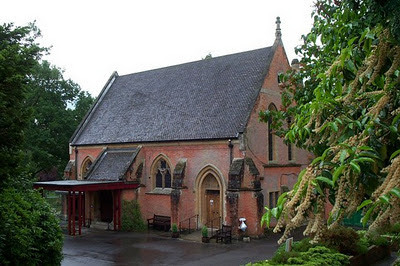 The cemetery is described in an 1847 poem, "Thoughts on Visiting Highgate Cemetery," in Douglas Jerrold's Shilling Magazine as "A Place of pleasant walks, and grassy slopes,/And girt about with trees ..." The Cemetery was consecrated in May of 1839 and originally consisted of about twenty acres on the side of Highgate Hill facing the metropolis and with a view to the city described in The Penny Magazine of that same year as "remarkably fine and ... alone well worth a visit..."
Part of the design of the cemetery was an "Egyptian" avenue with 32 vaults, each of which had room for twelve coffins. This theme was carried on with the "Circle of Lebanon" which by 1870 had been extended from its original twenty vaults to a total of thirty-six. These, and other features, made Highgate the fashionable cemetery of choice for many. 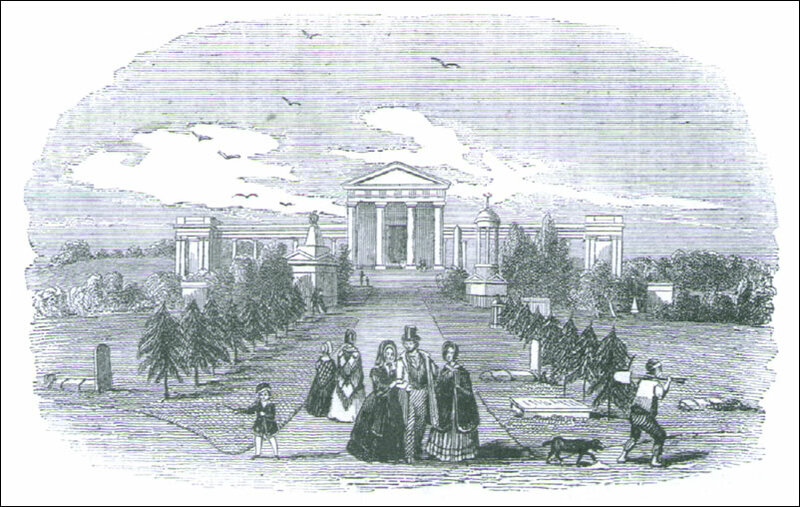 In the 1850s, the cemetery was extended by twenty acres, becoming the "East Cemetery." Here are found the graves of Charles Dickens' parents, his wife and his daughter as well as those of the scientist, Michael Faraday and poet Christina Rossetti. Buried here is Mrs. Henry Wood, the author of East Lynne, the "Napoleon of Crime," Adam Worth and the pugilist, Thomas Sayers. Tom Sayers' grave with his dog "Lion"
By the middle years of the 1850s, deaths in London exceeded 50,000 per year. The space required for such a large number of burials would have been about 48 acres. Both Kensal Green and Highgate were becoming crowded and there were problems with some of the other suburban cemeteries.So, while the problem of sanitation had been solved to some extent, the issue of space was still largely unresolved until cremation became more common. Although cremation was not illegal in England, and the first working crematorium was built in Woking, Surrey in 1879, it was not widely practised in the nineteenth century. In 1902, Parliament passed the Cremation Act which formalized the use of the practice and by 1968 more than half of all the dead in Britain were cremated. Today, that figure stands at around 70 per cent. For details as to the interment of the dead prior to the establishment of the great municipal cemeteries, download the Report on the sanitary conditions of the labouring population of Great Britain. A supplementary report on the results of a special inquiry into the practice of interment in towns. Made at the request of Her Majesty's principal secretary of state for the Home department -by clicking here. The cage crinoline, or hoop skirt, worn by women through the 1860s was based on a design patented in the 1840s. Although bulky and uncomfortable, it had the advantage of being light in weight and strong enough to support numerous layers of garments. Although worn by women of all social classes, those of the lower and labouring classes who wore it were often the subject of ridicule. Not surprisingly it was seen as an attempt to "ape" their betters for, as Thorsten Veblen noted, dress "in order to serve its purpose effectually, should not only be expensive, but it should also make plain to all observers that the wearer is not engaged in any kind of productive labour." 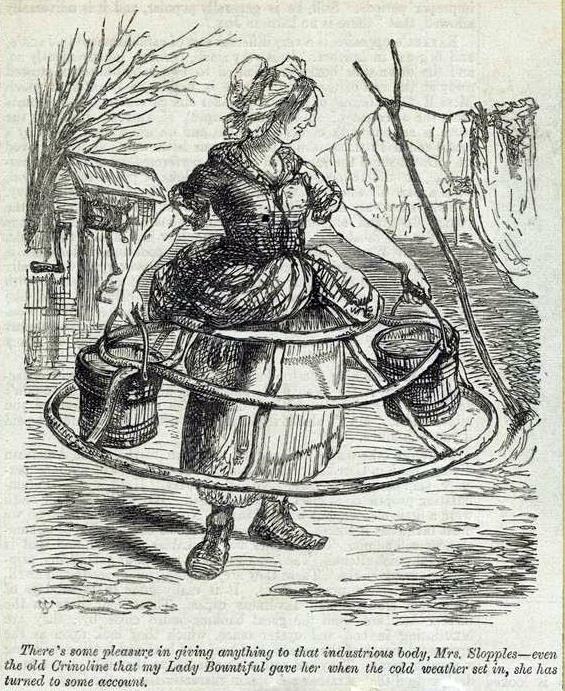 Surely there is little in the way of a woman's dress that would so clearly indicate that she is not engaged in productive labour as the crinoline. A woman's dress, Veblen goes on, "hampers the wearer at every turn and incapacitates her for all useful exertion." It personifies both conspicuous consumption and conspicuous leisure. Clearly the cost of cloth alone for a crinoline would have been greater than for a smaller outfit. It thus became an outward sign of one's wealth, or at least of the wealth of one's husband or father. Needless to say, with its great volume, the clothing was conspicuous, and should one fail to notice it at first glance (a highly unlikely scenario) one could hardly fail to notice it when trying to get through a doorway at the same time as a "crinolined" woman or find a seat on an omnibus. From the mid-1850s, good crinolines were made out of spring steel hoops which were both light and flexible. They were suspended, one above another, with the smallest at the top gradually widening towards the bottom. These devices could be made up of from as few as nine hoops to the larger and much more formal outfit consisting of up to eighteen circles of steel. Spring steel was particularly useful since it could be pressed out of shape temporarily, making it easier for the wearer of the garment (which at its widest could be up to six feet across) to get through doors, sit down, and enter and exit vehicles. Often, Sir, at ball or crowded assembly have I been gripped by the confluence of massive tissues. Often have I been suddenly and painfully compressed in a doorway by the framework of a creature whom nature had intended for a fairy. Nay, Sir, more than once have I, without a murmur, submitted during a pelting rain to banishment from my own carriage, constructed originally for the conveyance of four persons, but now, forsooth, not capable of one elderly and two youthful ladies, hedged in their shells like the clapper of a bell. In addition to the crinoline itself, and its covering, a woman would commonly wear drawers. The risk of falling or having one's dress caught by the wind could mean exposure not merely to the elements, but to the view of men and women nearby. Even walking up stairs might have considerable potential for embarrassment. Drawers commonly came to below the knees and were considered the most intimate garment that women wore. They were often gathered at the bottom and helped in the retention of modesty for those wearing a crinoline. Petticoats were also worn. 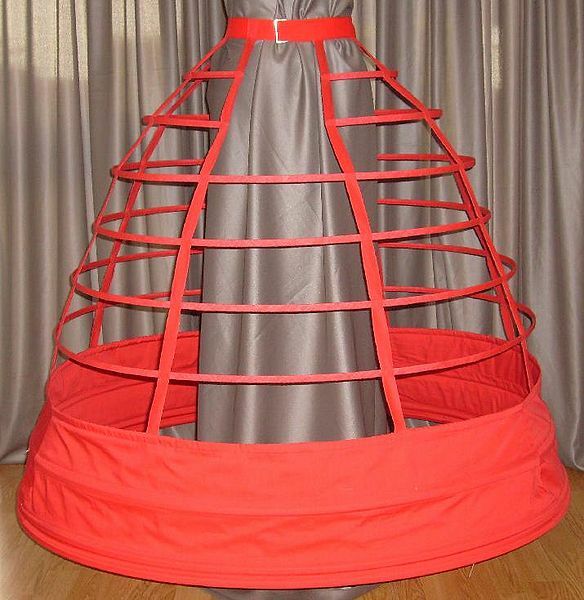 Generally the minimum would be one underneath the crinoline and one outside it to soften the look of the metal hoops. And curse the barriers of thy train. 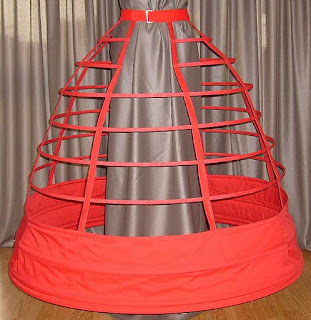 I can't get past that Crinoline! Ragamuffins in the street would shout after women in crinolines, "who's your cooper," and even Charles Babbage, the noted English mathematician and inventor of the difference machine, a fore-runner of the modern computer, was dragged into the discussion. 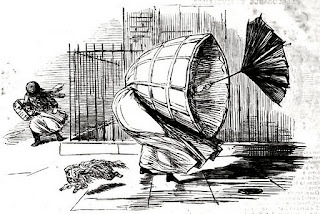 In a humorous note, in October of 1862, "Tickler" a regular contributor to the Edinburgh Magazine, refers to "those arid acres of crinoline, which Mr Babbage has calculated wuld cover, on to the thirty-second of last month, no less a surface than thirty miles six furlongs and a perch and a-half!" Young Mr Punch, by now in his adolescence, could hardly refrain from commenting. 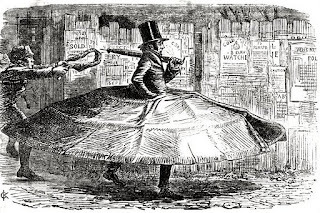 Numerous cartoons appeared during the 1850s and '60s, and even those that were not directly aimed at the crinoline would often feature women wearing outsized hoop skirts or, as only Punch could do, would take the idea of the hoop skirt and apply it to other uses as in the anti-garotting cartoon to the left. On a more serious note, the wide expanse of the crinoline, and the use of open flames in heating and lighting, meant that the risk of serious, if not fatal, injury was increased. In December 1858, the Liverpool Mercury reported the death of Lady Lucy Bridgman who had fatally burned herself while trying to extinguish the burning dress of her sister. 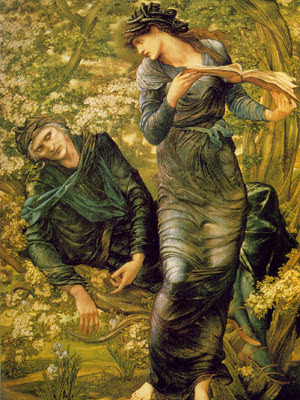 As well as the death of the two sisters, men of the family were burnt when they attempted to save the sisters. Commenting on this, T.M.S., writing to The Times describes how his wife's dress caught fire which, fortunately, he was able to extinguish. But, he asks, "When will this dangerous style of dress be done away with?" 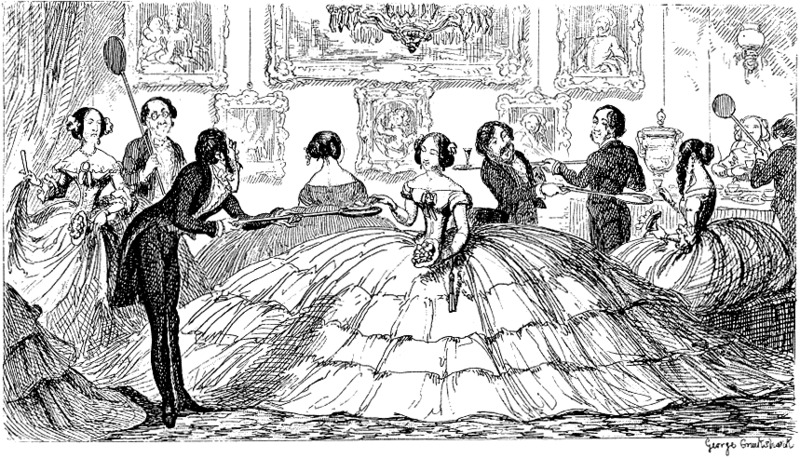 What was it, then, that made the crinoline so popular? The crinoline, prior to the use of spring steel had been relatively common, although significantly smaller in area and heavier in weight. With the ability to lighten the load on the wearer, it expanded (both literally and metaphorically) to meet, in England, the dictates of Paris fashion. It was, too, a way in which a woman was distanced, both physically and psychologically, from her surroundings, from the real world, and kept safe for her husband or father. In a sense it was the real-life equivalent of placing herself on the pedestal. Finally, it conformed well to the principles of conspicuous consumption and conspicuous leisure mentioned above. Not only was it a wasteful use of material, the cost of cleaning the clothing worn over the hoop and the effort involved in doing so would have been great. The fact that the wearer of such an outfit could do little more than stand or sit and would have been largely incapacitated from doing anything useful made it an ideal image for conspicuous leisure. 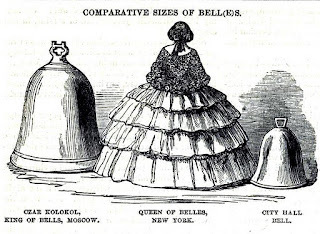 For a history of the corset and the crinoline, click here.